This article will help you find the best dice sets for D&D and other types of chance and role-playing games. See further below for what to look for in D&D dice for what I took into account when rating these sets of best polyhedral dice. It is generally more cost efficient to purchase a multi-set deal than to buy the cheapest singular set, but here is the best one I could find in case you’re interested. Click here for more cool and unique dice sets. Click here for more of the best metal dice set choices. The dice are important tools providing the randomization of your actions and widening the tree of possibilities. If you’re serious about your dice though, your carefully collected sets embody your in-game identity and even seem to give you an edge against difficult tasks and deadly encounters. Busting out the right set at the right time can seemingly break your cold dice streak, use a set too long and the rolls become stale and disappointing. If you’re a frequent player it’d be no surprise if you’ve already begun a collection containing a variety of colors, designs, and materials. Aside from seeking out awesome dice sets to form an expansive collection, you may eventually need to replace your dice due to wear and tear. After being rolled enough any die will start to take a more rounded form, and it won’t be quite as accurate as it once was. Whatever your reason, this guide will highlight the important qualities of any good set and list you the most awesome and best dice sets to fit your taste and/or your budget based on mine and other dice owners’ opinions. These are the dice that are included in all of the 7 dice set reviews. More uncommon dice that some sets may include are the d3, d5, d7, d14, d16, d24, and d30. These types of dice will be included in the other reviews below including d6 dice sets, cool and unique plastic/metal designs, and more. The colors & material of the die both contribute to its visual quality. Color schemes can include plain, translucent/opaque, marbled, two-tone, metallic, rainbow, and shadowy. The material used to create the die produces a different texture; the flat glossy appearance of plastic, the shiny brushed appearance of metal, or the grainy neutral look of wood. Dice accuracy refers to both the symmetry of the die and the fairness of the rolls. Quite simply it’s how close to a perfect shape the die has been crafted to as well as how evenly it has been weighted. A perfect shape will have equal measurements on all angles and faces. The more accurate the die is, the more fair the rolls will be. Any of the dice listed here are the best dice sets due to the high quality and accuracy these brands produce. There are reports of most cheaper inaccurate dice rolling lower more often than higher, so this is all the more reason to ensure you have the highest quality D&D dice set you can afford. The legibility of the print as well as its aesthetic appeal both come to mind when trying to describe the perfect style of die. Pretty self-explanatory, the best dice are going to have numbers that are easy to read and possibly catch the eye in some manner either through the dice font, the color contrast, or the way it’s been engraved. How you feel about this might make a difference due to the sheer volume of dice throws some games require. I believe most people like a bit of weight to their dice when they roll, but just how much would be your personal preference. Plastic dice can be light but most are pretty standardly weighted. 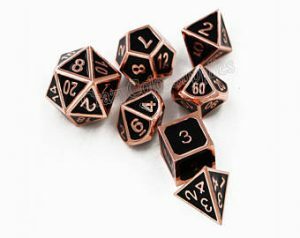 Metal dice sets are logically a fair bit heavier and feel quite solid bouncing around between your hands, and for this reason you should be selective as to which surface you roll them on. Another key factor that you will undoubtedly take into consideration when buying a set of dice is your budget. There are some dice out there that are sleek looking, high quality, and relatively affordable, and those are listed here as what I think are the best dice sets. Of course, if you have a little wiggle room in your budget you could choose from the more exquisite and unique dice sets that will be more scarce among your gaming company. Now that we know a good dice set when we see it, let’s take a look at some other cool and unique dice brand sets that I think are very well crafted. If you’re looking into purchasing you first metal d&d dice set, be sure to invest in some sort of surface or tray that you can roll on so you won’t damage any wood/glass surfaces. I will be making another article soon reviewing the best dice trays and dice towers to help you choose the right one. Along with that article I will also be reviewing the best DnD dice roller. Let me know what your favorite dice sets or other dice accessories are in the comments!